Gary Neville accused Chelsea's players of "turning it on and off like a tap" after Maurizio Sarri's criticism of his squad, and revealed more about the level of player power at Stamford Bridge. 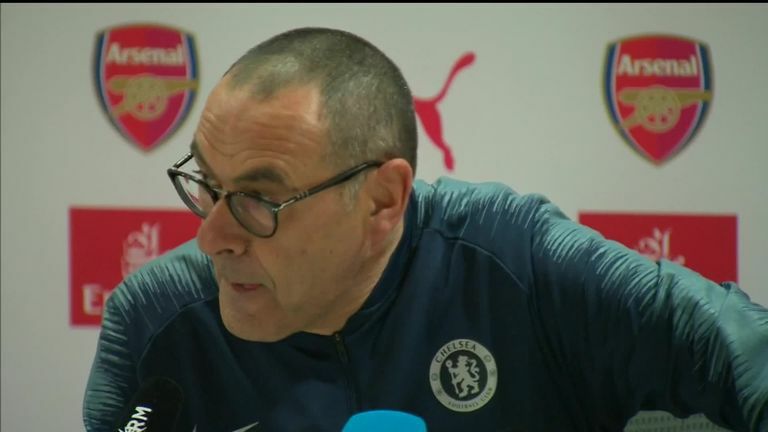 Sarri fumed at his side after they floundered to a 2-0 defeat at Arsenal on Saturday, their fifth loss in their last 12 games, and accused them of being difficult to motivate during an explosive rant translated from his native Italian. Neville said the number of previous Chelsea managers who had revealed problems in the Stamford Bridge dressing room was too much to ignore - but added Sarri may not be around long enough to fully address the problem. He said on the Gary Neville Podcast: "Sarri knows he's going to get sacked at some point in the next 18 months or two years, that's inevitable at Chelsea. He may as well call it how he sees it in the first six months when he's got a little bit of control. "It's just a dressing room which can turn it on and off like a tap, it's been able to do that for years. Sarri has probably thought he's an experienced guy, he's been around the block, and thinks he doesn't need to take it. "I have to say normally I would always say it's not right to call out your players. But we're going to see more of it, there's no doubt in the next five or 10 years. I think it'll become the norm, because it's us or them. "When managers have an aspect of control in the early parts of their jobs, they'll have to seize it and basically will realise they are a difficult bunch at Chelsea. In the last 10-15 years, they've had the power to remove managers." Neville recalled a game in 2012 when he first became aware of the level of player power at Chelsea, in the build-up to their 3-1 Champions League defeat by Napoli which would go some way to costing Andre Villas-Boas, the club's manager at the time, his job. He said: "There were noises in the afternoon, I was covering the game for Sky and there were agents of players ringing Sky reporters and commentators who were out there. It was the day Ashley Cole and Frank Lampard were left out, and Michael Essien. "I'd been at Manchester United as a player and seen a period of tranquillity, and players certainly don't go to their agents to tell the media about what's going on. But it's been like that - that's the type of club it is in terms of the way it operates. "Covering the second leg at Stamford Bridge, the players did that huddle on the pitch and basically took over the team."